SANTA FE -- Bighorn sheep skulls, deer and elk antlers, computers and dozens of 4-wheel-drive pickups will go to the highest bidders Saturday, July 19, at the Department of Public Safety in Santa Fe. The uncleaned bighorn skulls and horns and three bundles of horn sheaths will be among the first items offered in the auction, which will begin at 9 a.m. at the Department of Public Safety, 4491 Cerrillos Road. The skulls, collected by Department of Game and Fish biologists, are from two Rocky Mountain and two desert bighorn sheep that died from accidents and natural causes. Measurements from both desert bighorn skulls exceed qualifications to be listed in the Boone & Crockett record book. 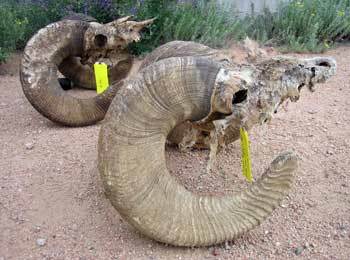 The Rocky Mountain bighorn skulls are somewhat smaller. The auction will include several bundles of antlers, skulls, horns and mounts of deer, elk and antelope, many of them trophy-size. A few bear skulls and mountain lion skulls and hides also will be offered. Department of Game and Fish pickups will be among hundreds of state and city vehicles offered in the auction. Most are 4-wheel-drive trucks used by conservation officers and biologists in the field. Interested bidders can inspect most items from 9 a.m. to 5 p.m. Friday at the lot, or from 7 to 9 a.m. Saturday. For more information about the auction, please contact James Cecil Auctioneers at (505) 393-4917 or visit www.jamescecilauctioneers.com. SANTA FE -- Hunters who were successful in the drawing for 2008-2009 New Mexico deer hunting permits will receive their permits and carcass tags in separate mailings this summer, the Department of Game and Fish announced. Hunters should begin receiving deer hunting permits in the mail this week. Carcass tags will be mailed soon. To legally hunt deer on public land in New Mexico, hunters must have a permit, carcass tag, a license, a Habitat Management and Access Validation, and a Habitat Stamp if hunting on BLM or U.S. Forest Service land. Licenses, validations and stamps can be purchased as one document over the counter at vendors statewide, online at www.wildlife.state.nm.us, and at Department offices in Santa Fe, Albuquerque, Raton, Las Cruces and Roswell. For more information, please call (505) 476-8087. SANTA FE -- The New Mexico Department of Game and Fish is requesting your help defending our state from an invasion of alien organisms, aquatic invasive/nuisance species that threaten our water supplies, fish, wildlife and aquatic ecosystems. More than 100 aquatic invasive species already are impacting New Mexico's natural resources, and the threats of zebra mussels and quagga mussels continue to grow despite regulations prohibiting their introduction to the state. To battle these invasive species, the Department, acting on behalf of the Aquatic Invasive Species Advisory Council of New Mexico, is requesting your input on the Draft New Mexico Aquatic Invasive Species Management Plan. Once established, the plan will make New Mexico eligible for federal matching funds to address activities specified in the management plan. Currently, New Mexico is not eligible for this funding because it has no plan. A final draft will be presented to the national Aquatic Nuisance Species Task Force and Governor Bill Richardson for approval. Individuals, groups, organizations, NGOs, tribes and agencies are encouraged to participate in this 30-day public participation period by submitting comments on this draft plan. For more information, please visit the Department website, www.wildlife.state.nm.us and click on “Public Comments,” or contact Brian Lang at (505) 476-8108 or brian.lang@state.nm.us. Additional information about aquatic invasive species is available by visiting www.protectyourwaters.net or www.fws.gov/answest. RATON -- The New Mexico Department of Game and Fish will conduct open-house meetings in northern New Mexico to receive public comments about the proposed big-game hunting rules that will affect the 2009-2011 seasons. Proposed adjustments to the existing rules include changes to permit numbers, hunt dates and Game Management Unit boundary changes that will go into affect April 1, 2009. These include proposed boundary changes in Units 5B, 51 and 41. Canjilon: 10 a.m. to 4 p.m. July 19 at the Canjilon Forest Service office. Raton: 2 p.m. to 8 p.m. July 26 at the Raton Game and Fish Office. Taos: 10 a.m. to 4 p.m. July 26 at the Taos Convention Center, 120 Civic Plaza Drive. Las Vegas: 6 p.m. to 8 p.m. Aug. 9 at Highlands University, in the Leveo Sanchez lecture hall in the Donnelly Library, room G35. If you do not have access to the internet please contact the Raton Game and Fish Office at 445-2311 for a copy of this summary.